All 2017 General Officer announcements for the Army, Air Force and Marine Corps. Army, Air Force, and Marine Corps with a pay-grade of O-7 and above are known as General Officers. Air Force Brig. Gen. Hubert C. Hegtvedt has been nominated to the rank of major general. Hegtvedt is currently serving as the deputy director, Global Policy and Partnerships, Joint Staff, Pentagon, Washington, District of Columbia. Air Force Brig. Gen. Timothy P. Kelly has been nominated to the rank of major general. Kelly is currently serving as the mobilization assistant to the commander, Air University, Air Education and Training Command, Maxwell Air Force Base, Alabama. Air Force Brig. Gen. Albert V. Lupenski has been nominated to the rank of major general. Lupenski is currently serving as the director, Plans, Programs and Requirements, Headquarters Air Force Reserve Command, Robins Air Force Base, Georgia. Air Force Brig. Gen. Samuel C. Mahaney has been nominated to the rank of major general. Mahaney is currently serving as the deputy director, Operations, Headquarters Air Mobility Command, Scott Air Force Base, Illinois. Air Force Brig. Gen. John B. Williams has been nominated to the rank of major general. Williams is currently serving as the mobilization assistant to the commander, Eighteenth Air Force, Air Mobility Command, Scott Air Force Base, Illinois. Air Force Col. Mitchel Neurock has been nominated to the rank of brigadier general. Neurock is currently serving as the mobilization assistant to the director, Administrative Law Directorate, Headquarters U.S. Air Force, Pentagon, Washington, District of Columbia. Air Force Maj. Gen. Jeffrey A. Rockwell for appointment to the rank of lieutenant general, and for assignment as the judge advocate general of the Air Force, Headquarters U.S. Air Force, Pentagon, Washington, District of Columbia. Rockwell is currently serving as the deputy judge advocate general, Headquarters U.S. Air Force, Pentagon, Washington, District of Columbia. Air Force Col. Ronald G. Allen Jr. has been nominated for appointment to the rank of brigadier general. Allen is currently serving as the commander, 341st Missile Wing, Air Force Global Strike Command, Malmstrom Air Force Base, Montana. Air Force Col. Mark R. August has been nominated for appointment to the rank of brigadier general. August is currently serving as the assistant director, operations, strategic deterrence and nuclear integration, Headquarters Air Mobility Command, Scott Air Force Base, Illinois. Air Force Col. Charles E. Brown, Jr. has been nominated for appointment to the rank of brigadier general. Brown is currently serving as the senior special assistant to the commander, U.S. European Command and Supreme Allied Commander, Europe, Headquarters U.S. European Command, Mons, Belgium. Air Force Col. Joel L. Carey has been nominated for appointment to the rank of brigadier general. Carey is currently serving as the commander, 12th Flying Training Wing, Air Education and Training Command, Joint Base San Antonio-Randolph, Texas. Air Force Col. Brenda P. Cartier has been nominated for appointment to the rank of brigadier general. Cartier is currently serving as the commander, 58th Special Operations Wing, Air Education and Training Command, Kirtland Air Force Base, New Mexico. Air Force Col. Darren R. Cole has been nominated for appointment to the rank of brigadier general. Cole is currently serving as the commander, 305th Air Mobility Wing, Air Mobility Command, Joint Base McGuire-Dix-Lakehurst, New Jersey. Air Force Col. Heath A. Collins has been nominated for appointment to the rank of brigadier general. Collins is currently serving as the senior materiel leader and system program manager, Ground Based Strategic Deterrent Systems Program Office, Air Force Nuclear Weapons Center, Air Force Materiel Command, Hill Air Force Base, Utah. Air Force Col. Douglas S. Coppinger has been nominated for appointment to the rank of brigadier general. Coppinger is currently serving as the commander, National Security Agency/Central Security Service-Texas, National Security Agency, Joint Base San Antonio-Lackland, Texas. Air Force Col. Matthew W. Davidson has been nominated for appointment to the rank of brigadier general. Davidson is currently serving as the executive officer to the chief of staff, U.S. Air Force, Headquarters U.S. Air Force, Pentagon, Washington, District of Columbia. Air Force Col. Todd A. Dozier has been nominated for appointment to the rank of brigadier general. Dozier is currently serving as the executive assistant to the commander, Pacific Air Forces, Headquarters Pacific Air Forces, Joint Base Pearl Harbor-Hickam, Hawaii. Air Force Col. Peter M. Fesler has been nominated for appointment to the rank of brigadier general. Fesler is currently serving as the vice director of operations, Headquarters North American Aerospace Defense Command, Peterson Air Force Base, Colorado. Air Force Col. Eric H. Froehlich has been nominated for appointment to the rank of brigadier general. Froehlich is currently serving as the vice commander, Air Force Sustainment Center, Air Force Materiel Command, Tinker Air Force Base, Oklahoma. Air Force Col. Michael A. Greiner has been nominated for appointment to the rank of brigadier general. Greiner is currently serving as the senior military assistant to the Assistant Secretary of the Air Force for Financial Management and Comptroller, Office of the Secretary of the Air Force, Pentagon, Washington, District of Columbia. Air Force Col. Andrew P. Hansen has been nominated for appointment to the rank of brigadier general. Hansen is currently serving as the director, joint and National Security Council matters, deputy chief of staff, operations, Headquarters U.S. Air Force, Pentagon, Washington, District of Columbia. Air Force Col. Michelle L. Hayworth has been nominated for appointment to the rank of brigadier general. Hayworth is currently serving as the deputy director, integrated air, space, cyberspace and intelligence, surveillance and reconnaissance operations, Headquarters Air Force Space Command, Peterson Air Force Base, Colorado. Air Force Col. Thomas K. Hensley has been nominated for appointment to the rank of brigadier general. Hensley is currently serving as the senior military assistant to the Under Secretary of Defense for Intelligence, Office of the Secretary of Defense, Pentagon, Washington, District of Columbia. Air Force Col. Jeffrey H. Hurlbert has been nominated for appointment to the rank of brigadier general. Hurlbert is currently serving as the director, senior official inquiries, Office of the Secretary of the Air Force Inspector General, Office of the Secretary of the Air Force, Pentagon, Washington, District of Columbia. Air Force Col. Stephen F. Jost has been nominated for appointment to the rank of brigadier general. Jost is currently serving as the chief, operations division, Air Force F-35 Integration Office, Office of the Chief of Staff, U.S. Air Force, Headquarters U.S. Air Force, Pentagon, Washington, District of Columbia. Air Force Col. Jeffrey R. King has been nominated for appointment to the rank of brigadier general. King is currently serving as the associate director, resource integration, deputy chief of staff, logistics, engineering and force protection, Headquarters U.S. Air Force, Pentagon, Washington, District of Columbia. Air Force Col. Leonard J. Kosinski has been nominated for appointment to the rank of brigadier general. Kosinski is currently serving as the director, Commander’s Action Group, Headquarters U.S. Africa Command, Stuttgart-Moehringen, Germany. Air Force Col. Thomas E. Kunkel has been nominated for appointment to the rank of brigadier general. Kunkel is currently serving as the chief, House Liaison Division, Office of the Secretary of the Air Force Legislative Liaison, Office of the Secretary of the Air Force, Pentagon, Washington, District of Columbia. Air Force Col. Laura L. Lenderman has been nominated for appointment to the rank of brigadier general. Lenderman is currently serving as the deputy director, strategic plans and policy, TCJ5/4, Headquarters U.S. Transportation Command, Scott Air Force Base, Illinois. Air Force Col. Rodney D. Lewis has been nominated for appointment to the rank of brigadier general. Lewis is currently serving as the director, Secretary of the Air Force; and chief of staff of the Air Force Executive Action Group, Office of the Air Force Chief of Staff, U.S. Air Force, Headquarters U.S. Air Force, Pentagon, Washington, District of Columbia. Air Force Col. Robert K. Lyman has been nominated for appointment to the rank of brigadier general. 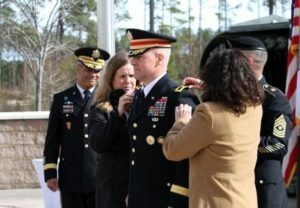 Lyman is currently serving as the director of communications, Headquarters Joint Special Operations Command, U.S. Special Operations Command, Fort Bragg, North Carolina. Air Force Col. David B. Lyons has been nominated for appointment to the rank of brigadier general. Lyons is currently serving as the vice commander, 12th Air Force, Air Combat Command, Davis-Monthan Air Force Base, Arizona. Air Force Col. Michael E. Martin has been nominated for appointment to the rank of brigadier general. Martin is currently serving as the commander, 24th Special Operations Wing, Air Force Special Operations Command, Hurlburt Field, Florida. Air Force Col. Joseph D. McFall has been nominated for appointment to the rank of brigadier general. McFall is currently serving as the vice commander, 3d Air Force and 17th Expeditionary Air Force, U.S. Air Forces in Europe, Ramstein Air Base, Germany. Air Force Col. David N. Miller, Jr. has been nominated for appointment to the rank of brigadier general. Miller is currently serving as the commander, 460th Space Wing, Air Force Space Command, Buckley Air Force Base, Colorado. Air Force Col. Christopher J. Niemi has been nominated for appointment to the rank of brigadier general. Niemi is currently serving as the commander, 3d Wing, Pacific Air Forces, Joint Base Elmendorf-Richardson, Alaska. Air Force Col. Clark J. Quinn has been nominated for appointment to the rank of brigadier general. Quinn is currently serving as the chief, strategic planning and integration division, deputy chief of staff for strategic plans and requirements, Headquarters U.S. Air Force, Pentagon, Washington, District of Columbia. Air Force Col. George M. Reynolds has been nominated for appointment to the rank of brigadier general. Reynolds is currently serving as military fellow, council of foreign relations, Air Force Research Institute, Air Education and Training Command, New York, New York. Air Force Col. Douglas A. Schiess has been nominated for appointment to the rank of brigadier general. Schiess is currently serving as the senior military assistant to the Under Secretary of the Air Force, Office of the Secretary of the Air Force, Pentagon, Washington, District of Columbia. Air Force Col. David W. Snoddy has been nominated for appointment to the rank of brigadier general. Snoddy is currently serving as the executive assistant to the director, National Security Agency; chief, Central Security Service; and commander, U.S. Cyber Command, Fort George Meade, Maryland. Air Force Col. Adrian L. Spain has been nominated for appointment to the rank of brigadier general. Spain is currently serving as the executive assistant to the commander, U.S. Northern Command; and commander, North American Aerospace Defense Command, Peterson Air Force Base, Colorado. Air Force Col. Ernest J. Teichert III has been nominated for appointment to the rank of brigadier general. Teichert is currently serving as the commander, 11th Wing, Joint Base Andrews, Maryland. Air Force Col. Alice W. Treviño has been nominated for appointment to the rank of brigadier general. Treviño is currently serving as the military assistant to the Deputy Secretary of Defense, Office of the Secretary of Defense, Pentagon, Washington, District of Columbia. Air Force Brig. Gen. Arthur E. Jackman Jr. has been nominated for appointment to the rank of major general. Jackman is currently serving as the mobilization assistant to the deputy judge advocate general, Office of the Judge Advocate General, Headquarters U.S. Air Force, Pentagon, Washington, District of Columbia. Air Force Brig. Gen. Josef F. Schmid III has been nominated for appointment to the rank of major general. Schmid is currently serving as the mobilization assistant to the Surgeon General of the Air Force, Headquarters U.S. Air Force, Pentagon, Washington, District of Columbia. Air Force Brig. Gen. Charles L. Plummer has been nominated for appointment to the rank of major general, and for assignment as the deputy judge advocate general, Headquarters U.S. Air Force, Pentagon, Washington, District of Columbia. Plummer is currently serving as the commander, Air Force Legal Operations Agency, Office of the Judge Advocate General, Headquarters U.S. Air Force, Joint Base Andrews, Maryland. Air Force Col. Sharon A. Shaffer has been nominated for appointment to the rank of brigadier general. Shaffer is currently serving as the staff judge advocate, Headquarters Air Combat Command, Joint Base Langley-Eustis, Virginia. Air Force Col. Paul A. Friedrichs has been nominated for appointment to the rank of brigadier general. Friedrichs is currently serving as the command surgeon, Headquarters U.S. Transportation Command, Scott Air Force Base, Illinois. Air Force Col. Lee H. Harvis has been nominated for appointment to the rank of brigadier general. Harvis is currently serving as the command surgeon, Headquarters Pacific Air Forces, Joint Base Pearl Harbor-Hickam, Hawaii. Air Force Col. Robert J. Marks has been nominated for appointment to the rank of brigadier general, and for assignment as chief of the Air Force Nurse Corps, Office of the Surgeon General of the Air Force, Headquarters U.S. Air Force, Falls Church, Virginia. Marks is currently serving as the command surgeon, Air Force Materiel Command, Wright-Patterson Air Force Base, Ohio. Air Force Col. Sharon R. Bannister has been nominated for appointment to the rank of brigadier general, and for assignment as assistant surgeon general for dental services, Office of the Surgeon General of the Air Force, Headquarters U.S. Air Force, Falls Church, Virginia. Bannister is currently serving as the deputy program officer, Medical Department of Defense, Falls Church, Virginia. Air Force Col. John M. Breazeale has been nominated for appointment to the rank of brigadier general. Breazeale is currently serving as the mobilization assistant to the commander, U.S. Air Force Warfare Center, Air Combat Command, Nellis Air Force Base, Nevada. Air Force Col. Damon S. Feltman has been nominated for appointment to the rank of brigadier general. Feltman is currently serving as the vice commander, Tenth Air Force, Air Force Reserve Command, Naval Air Station Joint Reserve Base Fort Worth, Texas. Air Force Col. Anne B. Gunter has been nominated for appointment to the rank of brigadier general. Gunter is currently serving as the director of manpower, personnel and services, Headquarters Air Force Reserve Command, Robins Air Force Base, Georgia. Air Force Col. Scheid P. Hodges has been nominated for appointment to the rank of brigadier general. Hodges is currently serving as the mobilization assistant to the vice commander, Seventh Air Force, Pacific Air Forces, Osan Air Base, Republic of Korea. Air Force Col. Richard L. Kemble has been nominated for appointment to the rank of brigadier general. Kemble is currently serving as the mobilization assistant to the director, strategic plans, requirements and programs, Headquarters Air Mobility Command, Scott Air Force Base, Illinois. Air Force Col. Tanya R. Kubinec has been nominated for appointment to the rank of brigadier general. Kubinec is currently serving as the mobilization assistant to the director, Defense Contract Management Agency, Fort Lee, Virginia. Air Force Col. Erich C. Novak has been nominated for appointment to the rank of brigadier general. Novak is currently serving as the mobilization assistant to the commander, Twentieth Air Force, Air Force Global Strike Command, Francis E. Warren Air Force Base, Wyoming. Air Force Col. Jeffrey T. Pennington has been nominated for appointment to the rank of brigadier general. Pennington is currently serving as the mobilization assistant to the commander, Curtis E. LeMay Center for Doctrine Development and Education, Air University, Air Education and Training Command, Maxwell Air Force Base, Alabama. Air Force Col. John N. Tree, has been nominated for appointment to the rank of brigadier general. Tree is currently serving as the mobilization assistant to the commander, Oklahoma City Air Logistics Complex, Air Force Materiel Command, Tinker Air Force Base, Oklahoma. Air Force Col. Aaron G. Vangelisti has been nominated for appointment to the rank of brigadier general. Vangelisti is currently serving as the mobilization assistant to the deputy chief of staff, manpower, personnel and services, Headquarters U.S. Air Force, Pentagon, Washington, District of Columbia. Air Force Col. William W. Whittenberger Jr. has been nominated for appointment to the rank of brigadier general. Whittenberger is currently serving as the mobilization assistant to the director of strategic plans, programs and requirements, Headquarters Air Force Special Operations Command, Hurlburt Field, Florida. Air Force Col. Christopher F. Yancy has been nominated for appointment to the rank of brigadier general. Yancy is currently serving as the mobilization assistant to the director, plans, programs and analyses, Headquarters U.S. Air Forces in Europe, Ramstein Air Base, Germany. Air Force Maj. Gen. Anthony J. Cotton for appointment to the rank of lieutenant general, and for assignment as commander and president, Air University, Air Education and Training Command, Maxwell Air Force Base, Alabama. Cotton is currently serving as commander, 20th Air Force, Air Force Global Strike Command, and commander, Task Force 214, U.S. Strategic Command, Francis E. Warren Air Force Base, Wyoming. Air Force Maj. Gen. Dorothy A. Hogg for appointment to the rank of lieutenant general, and for assignment as surgeon general of the Air Force, Headquarters U.S. Air Force, Pentagon, Washington, District of Columbia. Hogg is currently serving as deputy surgeon general and chief of the Air Force Nurse Corps, Office of the Surgeon General, Headquarters U.S. Air Force, Falls Church, Virginia. Air Force Maj. Gen. David D. Thompson for appointment to the rank of lieutenant general, and for assignment as deputy chief of staff, Space Superiority, Headquarters U.S. Air Force, Pentagon, Washington, District of Columbia. Thompson is currently serving as deputy commander, Air Force Space Command, Peterson Air Force Base, Colorado. Air Force Brig. Gen. Sam C. Barrett has been nominated for appointment to the rank of major general. Barrett is currently serving as the commander, Joint Enabling Capabilities Command, U.S. Transportation Command, Norfolk, Virginia. Marine Corps Lt. Gen. Mark A. Brilakis for appointment to the rank of lieutenant general, and for assignment as commander, U.S. Marine Corps Forces Command; and commanding general, Fleet Marine Force Atlantic. Brilakis is currently serving as the deputy commandant for manpower and reserve affairs, Headquarters, U.S. Marine Corps, Quantico, Virginia. Marine Corps Maj. Gen. Michael A. Rocco for appointment to the rank of lieutenant general, and for assignment as deputy commandant for manpower and reserve affairs, Headquarters, U.S. Marine Corps. Rocco is currently serving as the director, Manpower Management Division, Headquarters, U.S. Marine Corps, Quantico, Virginia. Marine Corps Maj. Gen. Daniel J. O’Donohue for appointment to the rank of lieutenant general, and for assignment as deputy commandant for information, Headquarters, U.S. Marine Corps. O’Donohue is currently serving as the commanding general, 1st Marine Division, Camp Pendleton, California. Marine Corps Lt. Gen. Vincent R. Stewart for appointment to the rank of lieutenant general, and for assignment as deputy commander, U.S. Cyber Command. Stewart is currently serving as the director, Defense Intelligence Agency, Washington, District of Columbia. Marine Corps Lt. Gen. Kenneth F. McKenzie Jr., for appointment to the rank of lieutenant general, and for assignment as director, Joint Staff. McKenzie is currently serving as the director, strategic plans and policy, J-5, Joint Staff, Washington, District of Columbia. Marine Corps Maj. Gen. John J. Broadmeadow for appointment to the rank of lieutenant general, and for assignment as deputy commander, U.S. Transportation Command. Broadmeadow is currently serving as commander, Marine Corps Installations Command; assistant deputy commandant for installations and logistics (facilities); and commander, Marine Corps National Capital Region, Washington, District of Columbia. Marine Corps Maj. Gen. Clardy for appointment to the rank of lieutenant general, and for assignment as military deputy for readiness to the Under Secretary of Defense for Personnel and Readiness. Clardy is currently serving as deputy director, force management, application and support, J-8, Joint Staff, Washington, District of Columbia. Lt. Gen. John B. Cooper for appointment to the rank of lieutenant general, and for assignment as commander, Air Force Sustainment Center, Air Force Materiel Command, Tinker Air Force Base, Oklahoma. Cooper is currently serving as deputy chief of staff, logistics, engineering and force protection, Headquarters U.S. Air Force, Pentagon, Washington, District of Columbia. Lt. Gen. Lee K. Levy II for appointment to the rank of lieutenant general, and for assignment as deputy chief of staff, logistics, engineering, and force protection, Headquarters U.S. Air Force, Pentagon, Washington, District of Columbia. Levy is currently serving as commander, Air Force Sustainment Center, Air Force Materiel Command, Tinker Air Force Base, Oklahoma. Air Force Maj. Gen. Scott A. Howell for appointment to the rank of lieutenant general, and for assignment as vice commander, U.S. Special Operations Command, Pentagon, Washington, District of Columbia. Howell is currently serving as commander, Special Operations Joint Task Force, Afghanistan; and commander, North Atlantic Treaty Organization Special Operations Component Command, Afghanistan, U.S. Forces Afghanistan, Bagram, Afghanistan. Air Force Maj. Gen. James C. Vechery for appointment to the rank of lieutenant general, and for assignment as deputy commander for military operations, U.S. Africa Command, Stuttgart, Germany. Vechery is currently serving as director, operational capability requirements, Deputy Chief of Staff for Strategic Plans and Requirements, Headquarters U.S. Air Force, Pentagon, Washington, District of Columbia. Air Force Col. DeAnna M. Burt has been nominated for appointment the grade of brigadier general. Burt is currently serving as commander, 50th Space Wing, Air Force Space Command, Schriever Air Force Base, Colorado. Marine Corps Gen. Joseph F. Dunford has been nominated for reappointment as chairman of the Joint Chiefs of Staff. Dunford has been serving as the chairman of the Joint Chiefs of Staff since September 2015. Air Force Maj. Gen. Jay B. Silveria has been nominated for appointment to the rank of lieutenant general, and for assignment as superintendent, U.S. Air Force Academy, Colorado Springs, Colorado. Silveria is currently serving as deputy commander, U.S. Air Forces Central Command; and deputy, Combined Forces Air Component Commander, U.S. Central Command, Southwest Asia. Marine Corps Maj. Gen. Steven R. Rudder has been nominated for appointment to the rank of lieutenant general, and for assignment as deputy commandant for aviation, Headquarters, Marine Corps. Rudder is currently serving as the director, J-5, U.S. Pacific Command, Camp H. M. Smith, Hawaii. Air Force Lt. Gen. Steven L. Kwast for appointment to the rank of lieutenant general, and for assignment as commander, Air Education and Training Command, Joint Base San Antonio-Randolph, Texas. Kwast is currently serving as commander and president, Air University, Air Education and Training Command, Maxwell Air Force Base, Alabama. Air Force Maj. Gen. Bradford J. Shwedo for appointment to the rank of lieutenant general, and for assignment as chief, Information Dominance; and chief information officer, Office of the Secretary of the Air Force, Pentagon, Washington, District of Columbia. Shwedo is currently serving as commander, 25th Air Force, Air Combat Command, Joint Base San Antonio-Lackland, Texas. Air Force Maj. Gen. Giovanni K. Tuck for appointment to the rank of lieutenant general, and for assignment as commander, Eighteenth Air Force, Air Mobility Command, Scott Air Force Base, Illinois. Tuck is currently serving as director, Operations and Plans, Headquarters U.S. Transportation Command, Scott Air Force Base, Illinois. Air Force Brig. Gen. Tony D. Bauernfeind has been nominated to the grade of major general. Bauernfeind is currently serving as the commander, Special Operations Command Korea, U.S. Forces Korea and United Nations Command Special Operations Component; and deputy commander, Combined Unconventional Warfare Task Force, United Nations Command, Korea, Yongsan, South Korea. Air Force Brig. Gen. Mark D. Camerer has been nominated to the grade of major general. Camerer is currently serving as the director, Logistics, Headquarters U.S. Africa Command, Stuttgart, Germany. Air Force Brig. Gen. William T. Cooley has been nominated to the grade of major general. Cooley is currently serving as the program executive for programs and integration, Missile Defense Agency, Redstone Arsenal, Alabama. Air Force Brig. Gen. Stephen L. Davis has been nominated to the grade of major general. Davis is currently serving as the director, Manpower, Organization and Resources, Deputy Chief of Staff, Manpower, Personnel and Services, Headquarters U.S. Air Force, Pentagon, Washington, District of Columbia. Air Force Brig. Gen. Patrick J. Doherty has been nominated to the grade of major general. Doherty is currently serving as the commander, 82nd Training Wing, Air Education and Training Command, Sheppard Air Force Base, Texas. Air Force Brig. Gen. James A. Jacobson has been nominated to the grade of major general. Jacobson is currently serving as the inspector general, Headquarters Air Mobility Command, Scott Air Force Base, Illinois. Air Force Brig. Gen. David A. Krumm has been nominated to the grade of major general. Krumm is currently serving as the deputy director for requirements, J-8, Joint Staff, Pentagon, Washington, District of Columbia. Air Force Brig. Gen. Jeffrey A. Kruse has been nominated to the grade of major general. Kruse is currently serving as the director, Intelligence, J-2, Headquarters U.S. Pacific Command, Camp H.M. Smith, Hawaii. Air Force Brig. Gen. Michael A. Minihan has been nominated to the grade of major general. Minihan is currently serving as the deputy director of operations, J-3, Headquarters U.S. Pacific Command, Camp H.M. Smith, Hawaii. Air Force Brig. Gen. Shaun Q. Morris has been nominated to the grade of major general. Morris is currently serving as the Air Force program executive officer for weapons and director, Armament Directorate, Air Force Life Cycle Management Center, Air Force Materiel Command, Eglin Air Force Base, Florida. Air Force Brig. Gen. Thomas E. Murphy has been nominated to the grade of major general. Murphy is currently serving as the deputy director, Command, Control, Communications and Computers/Cyber Systems, J-6, Joint Staff, Pentagon, Washington, District of Columbia. Air Force Brig. Gen. David S. Nahom has been nominated to the grade of major general. Nahom is currently serving as the deputy director, Plans and Programs, Headquarters Air Combat Command, Joint Base Langley-Eustis, Virginia. Air Force Brig. Gen. Stephen W. Oliver Jr. has been nominated to the grade of major general. Oliver is currently serving as the vice commander, U.S. Air Force Expeditionary Center, Air Mobility Command, Joint Base McGuire-Dix-Lakehurst, New Jersey. Air Force Brig. Gen. John M. Pletcher has been nominated to the grade of major general. Pletcher is currently serving as the director, Financial Management, Headquarters Air Force Materiel Command, Wright-Patterson Air Force Base, Ohio. Air Force Brig. Gen. Scott L. Pleus has been nominated to the grade of major general. Pleus is currently serving as the director, F-35 Integration Office, Office of the Vice Chief of Staff of the Air Force, Headquarters U.S. Air Force, Pentagon, Washington, District of Columbia. Air Force Brig. Gen John T. Rauch Jr. has been nominated to the grade of major general. Rauch is currently serving as the director, Intelligence, Surveillance, and Reconnaissance Capabilities, Deputy Chief of Staff, Intelligence, Surveillance, and Reconnaissance, Headquarters U.S. Air Force, Pentagon, Washington, District of Columbia. Air Force Brig. Gen. Brian S. Robinson has been nominated to the grade of major general. Robinson is currently serving as the director, Operations, Headquarters Air Mobility Command, Scott Air Force Base, Illinois. Air Force Brig. Gen. Ricky N. Rupp has been nominated to the grade of major general. Rupp is currently serving as the senior defense official and defense attaché-Israel, Defense Intelligence Agency, U.S. Embassy, Tel Aviv, Israel. Air Force Brig. Gen. Dirk D. Smith has been nominated to the grade of major general. Smith is currently serving as the director, Air and Cyberspace Operations, Headquarters Pacific Air Forces, Joint Base Pearl Harbor-Hickam, Hawaii. Air Force Brig. Gen. Kirk W. Smith has been nominated to the grade of major general. Smith is currently serving as the director, Force Management and Development, Headquarters U.S. Special Operations Command, MacDill Air Force Base, Florida. Air Force Brig. Gen. Paul W. Tibbets IV has been nominated to the grade of major general. Tibbets is currently serving as the commander, 509th Bomb Wing, Air Force Global Strike Command, Whiteman Air Force Base, Missouri. Air Force Brig. Gen. Andrew J. Toth has been nominated to the grade of major general. Toth is the assistant deputy commander, U.S. Air Forces Central Command; and assistant vice commander, 9th Air Expeditionary Task Force, Air Combat Command, Shaw Air Force Base, South Carolina. Air Force Brig. Gen. Mark E. Weatherington has been nominated to the grade of major general. Weatherington is the director, Cyberspace Operations, North American Aerospace Defense Command/U.S. Northern Command, Peterson Air Force Base, Colorado. Marine Corps Brig. Gen. Edward D. Banta has been nominated for appointment to the rank of major general. Banta is currently serving as the chief, Combined Joint Logistics, Resolute Support Headquarters, Kabul, Afghanistan. Marine Corps Brig. Gen. Robert F. Castellvi has been nominated for appointment to the rank of major general. Castellvi is currently serving as the deputy commanding general, II Marine Expeditionary Force; and commanding general, 2d Marine Expeditionary Brigade, Camp Lejeune, North Carolina. Marine Corps Brig. Gen. Matthew G. Glavy has been nominated for appointment to the rank of major general. Glavy is currently serving as the commanding general, 2d Marine Aircraft Wing, Cherry Point, North Carolina. Marine Corps Brig. Gen. Michael S. Groen has been nominated for appointment to the rank of major general. Groen is currently serving as the vice director, J-2, Joint Staff, Washington, District of Columbia. Marine Corps Brig. Gen. Kevin M. Iiams has been nominated for appointment to the rank of major general. Iiams is currently serving as the commander, U.S. Marine Corps Forces South, Miami, Florida. Marine Corps Brig. Gen. William F. Mullen III has been nominated for appointment to the rank of major general. Mullen is currently serving as the commanding general, Marine Corps Air Ground Combat Center, Twentynine Palms, California. Marine Corps Brig. Gen. Gregg P. Olson has been nominated for appointment to the rank of major general. Olson is currently serving as the Marine Corps representative to the Quadrennial Defense Review, Headquarters, U.S. Marine Corps, Washington, District of Columbia. Marine Corps Brig. Gen. Eric M. Smith has been nominated for appointment to the rank of major general. Smith is currently serving as the assistant deputy commandant, Plans, Policies and Operations, Headquarters, U.S. Marine Corps, Washington, District of Columbia. Marine Corps Reserve Brig. Gen. David G. Bellon has been nominated for appointment to the rank of major general. Bellon is currently serving as the director, Reserve Affairs Division, Headquarters, U.S. Marine Corps, Quantico, Virginia. Marine Corps Reserve Brig. Gen. Patrick J. Hermesmann has been nominated for appointment to the rank of major general. Hermesmann is currently serving as the deputy commanding general for mobilization, Marine Forces Command, Norfolk, Virginia. Marine Corps Col. James H. Adams III has been nominated for appointment to the rank of brigadier general. Adams is currently serving as the branch head, Aviation Plans and Policy Branch, Deputy Commandant for Aviation, Headquarters, U.S. Marine Corps, Washington, District of Columbia. Marine Corps Col. Eric E. Austin has been nominated for appointment to the rank of brigadier general. Austin is currently serving as the executive assistant to the commandant of the Marine Corps, Headquarters, U.S. Marine Corps, Washington, District of Columbia. Marine Corps Col. Jay M. Bargeron has been nominated for appointment to the rank of brigadier general. Bargeron is currently serving as the director, Marine Air Ground Task Force Training Exercise Control Group, Twenty-Nine Palms, California. Marine Corps Col. Michael J. Borgschulte has been nominated for appointment to the rank of brigadier general. Borgschulte is currently serving as the commanding officer, Marine Aircraft Group 39, 3d Marine Aircraft Wing, Camp Pendleton, California. Marine Corps Col. William J. Bowers has been nominated for appointment to the rank of brigadier general. Bowers is currently serving as the military assistant to the assistant commandant of the Marine Corps, Headquarters, U.S. Marine Corps, Washington, District of Columbia. Marine Corps Col. Dimitri Henry has been nominated for appointment to the rank of brigadier general. Henry is currently serving as the executive officer, Defense Intelligence Agency, Washington, District of Columbia. Marine Corps Col. Keith D. Reventlow has been nominated for appointment to the rank of brigadier general. Reventlow is currently serving as the chief of staff, Marine Corps Logistics Command, Albany, Georgia. Marine Corps Col. Roberta L. Shea has been nominated for appointment to the rank of brigadier general. Shea is currently serving as the commanding officer, I Marine Expeditionary Force Headquarters Group, Camp Pendleton, California. Marine Corps Col. Benjamin T. Watson has been nominated for appointment to the rank of brigadier general. Watson is currently serving as the assistant division commander, 2d Marine Division, Camp Lejeune, North Carolina. Marine Corps Col. Christian F. Wortman has been nominated for appointment to the rank of brigadier general. Wortman is currently serving as the assistant chief of staff, G-3, I Marine Expeditionary Force, Camp Pendleton, California. Marine Corps Reserve Col. Michael S. Martin has been nominated for appointment to the rank of brigadier general. Martin is currently serving as the deputy chief of staff for plans and the Marine detachment commanding officer, Joint Enabling Capabilities Command, Norfolk, Virginia.